The lights of tall bland hotel and condo buildings become beautiful when the fog veils the dull structures and blurs the light in radial halos. Once, walking, saw jellyfish everywhere, viscous corpses abandoned by the ocean on 100-degree-Fahrenheit sand. Once, walking, saw large carrion birds towering over the gelatinous alien bodies of jellyfish and pulling them apart with sharp beaks. Once, walking up by the zenith of ocean deposits, where previous high tide mark meets the first of the vegetation, the cacti and sea oats holding together the dunes, found the hard strange little bodies of starfish. Once, walking, saw the sleek dorsal fins and curves of the backs of dolphins in the waves. Once, walking, saw a beautiful young woman with long thick red hair, unconscious from drinking, lying among the dunes. Once, walking, saw a brown pelican, taller than children, absolutely ancient, eyes like living dead-things, long pouched bill, standing with its great wings extended perfectly out to the sides of a great ribcage, facing the ocean, an accidental image of prehistoric prayer. Once, walking, saw an old man in the dunes, camped beneath a vast umbrella, with bottles and coolers and tourist trinkets arranged all around him in the sand, with an American flag implanted before his camp, separating him from the sea. Once, walking, found half the body and the whole hard tail of a horseshoe crab. Somebody said it looked like the offspring of a howitzer tank and a cockroach. Once, walking, saw an old mannequin washed up from no one knows what continent, took the mannequin home and propped her up on the deck of this beach house. The house has few 90-degree angles anywhere. The main room is two stories tall with a 50-foot diameter that opens up through windows in every direction. The mannequin faces each sunrise and each threatening storm. In the 1850s, amateur historian and architect Orson Squire Fowler published a book called A Home for All. Fowler had popularized phrenology, the pseudo-scientific system of reading the bumps and contours of a person’s head to determine character traits and what life possibilities those traits might create. Fowler had been an early publisher, when no one else would touch it, of Leaves of Grass. Fowler, in A Home for All, attributed health benefits to the Octagon House, sometimes now referred to as the “Octagon Style” of Victorian architecture. Such health benefits, he said, were obtained through better ventilation and lighting. More than a thousand Octagon Houses were built the decade after Fowler’s book was published. But this Octagon House wasn’t built until 1971. The house should be resistant to winds of up to 150 miles per hour. The angles deflect the wind. Once, walking, found in the saline foam at the extent of the tide a small plastic figurine with bagpipes, took it home and made of it a snow globe. Once, walking, found a perfect thing. 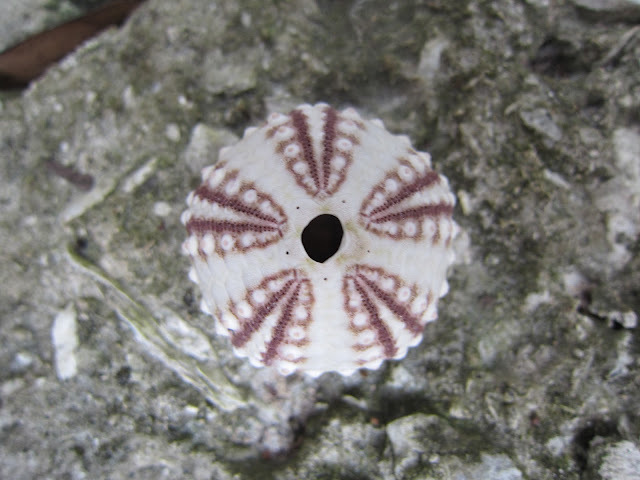 The spiny round shell of a sea urchin is called a test. 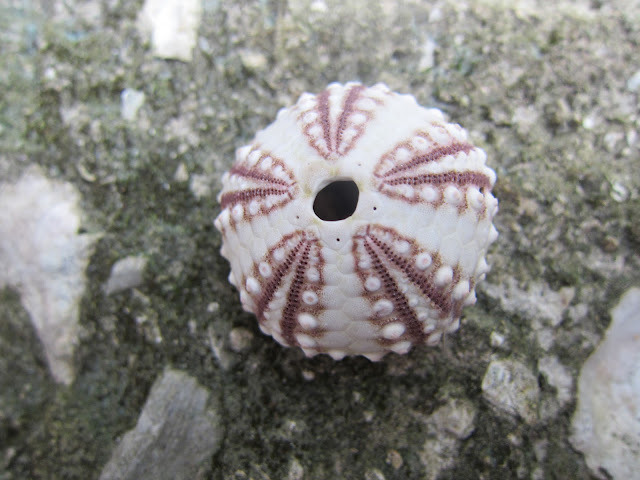 Once, walking, found a sea urchin test. Perfect. Five red triangular bands spaced evenly apart from the hole in the top of the center. An artwork, the finest one. No sharp edges, contoured gracefully. No more than an inch from side to side. A small house. The angles deflect the wind.